This would be a great gift to yourself or others! Become more of who you really are! 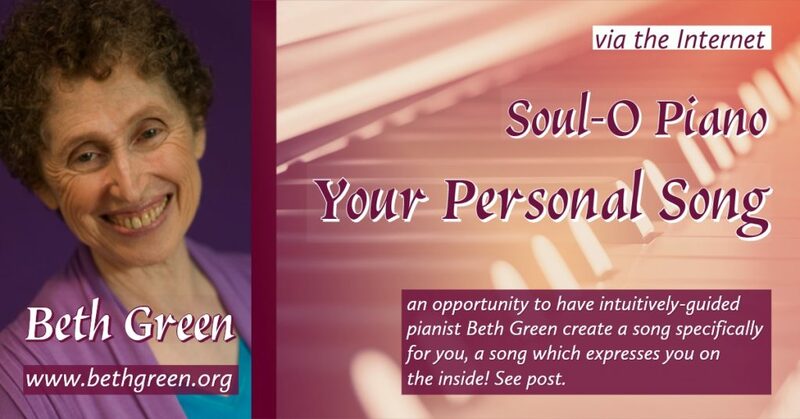 In these extraordinary sessions, Beth combines her outstanding intuitive counseling gifts with her intuitively-guided piano music, all geared to helping you connect more deeply to yourself. First you connect via videoconference. (You can use the phone, but it’s not as effective.) 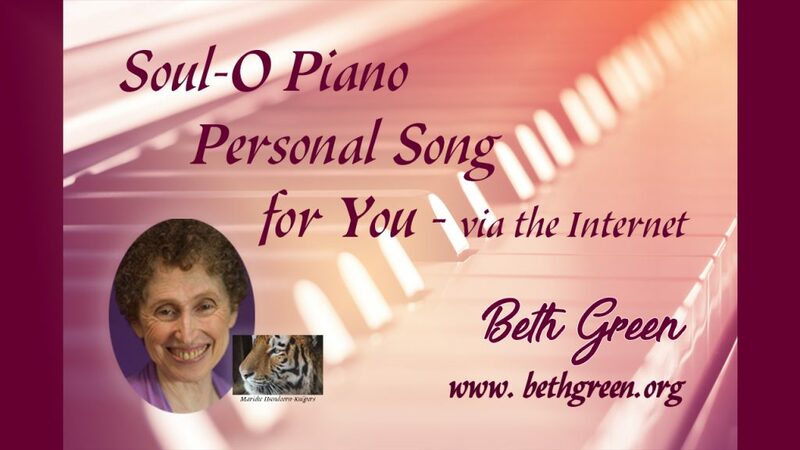 After talking for about 20 minutes, Beth intuits a piece of piano music that expresses you, and she does it right in the session in front of you. After recording your song, she makes audio files of it and sends them to you. Listening to the song will help empower your inner being. To record your song, Beth plays on her world-class 7-foot Shigeru Kawai grand piano, using excellent recording equipment and recording in stereo. After the session, Beth will send you two copies of your song: one in a WAV format, which is very high quality sound in a big file, and the other in an mp3 format, which is good but a much smaller file. As long as you have email, you will be able to receive the music by going to Beth’s Dropbox and downloading the files. Listen to your song over and over – even several times in a row or on several occasions each day. While you listen to your song, the impact builds, as you continue to feel and hear the vibrational energy that represents you. Use the best speakers you can for maximum benefit. The cost of the Session & Song is $150 in total, and you can put yourself on Beth’s scheduling calendar by clicking here. As further support for your well-being, you may also want to sign up for some very powerful intuitively-guided counseling sessions called Twenty Minutes with Beth. For more information about her intuitive counseling, intuition trainings, music, livestream, groups, retreats and more, check out the rest of this website. Sign up here to give this gift to yourself or a loved one. Some people have trouble embracing their song. They may love it, but they have a reaction to acknowledging or taking it in. Maybe the song reflects a being diametrically opposite to the “self” the ego has tried to present. Don’t worry. Keep listening to it, and if you continue to have difficulties embracing it, please consider a counseling session, where you and Beth can explore why you are having trouble being you. Check out Twenty Minutes with Beth. Over time, you will sense when you’re ready for a new song. You can then schedule another session and a new piece to help move you to the next level of well-being. 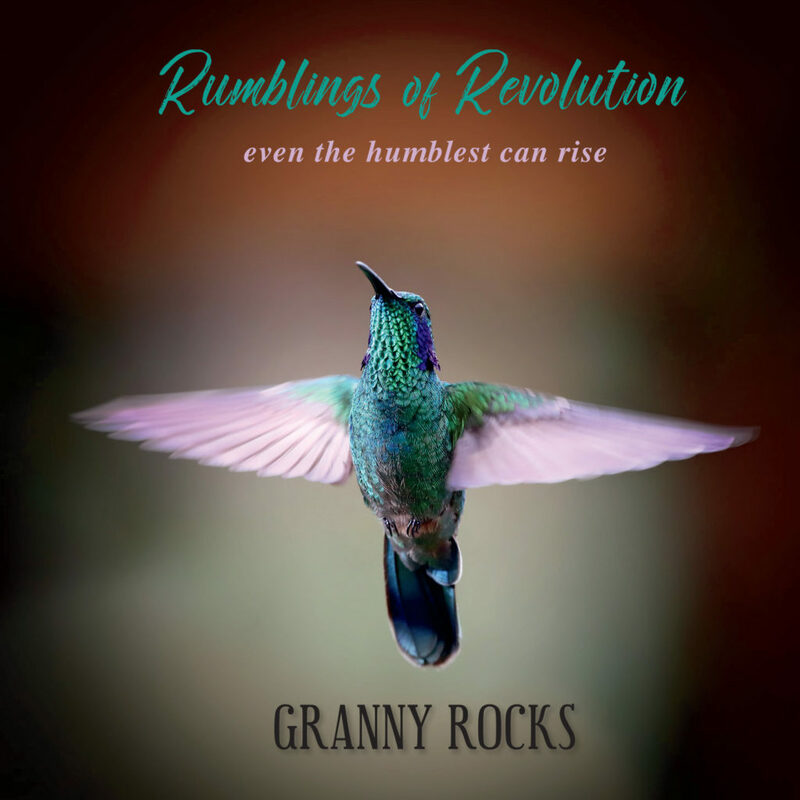 To hear some of Beth’s piano improvisations — Soul-O Piano, Personal Songs, Solo Piano Plus, or her recorded compositions, check out Granny Rocks TV on YouTube. But And better, yet, below is the link to the Personal Song playlist. It’s made up of personal songs that the recipients have wanted to share with you. Just click on This Could Be Your Personal Song and you can hear a variety. The newest one comes first. This Could Be You Personal Song! Click the link above to check out some personal songs, and see if you wouldn’t like one of your own or one for a loved one. If you would like to schedule yourself for Your Personal Song, just click here, and you can book a time that works for you.